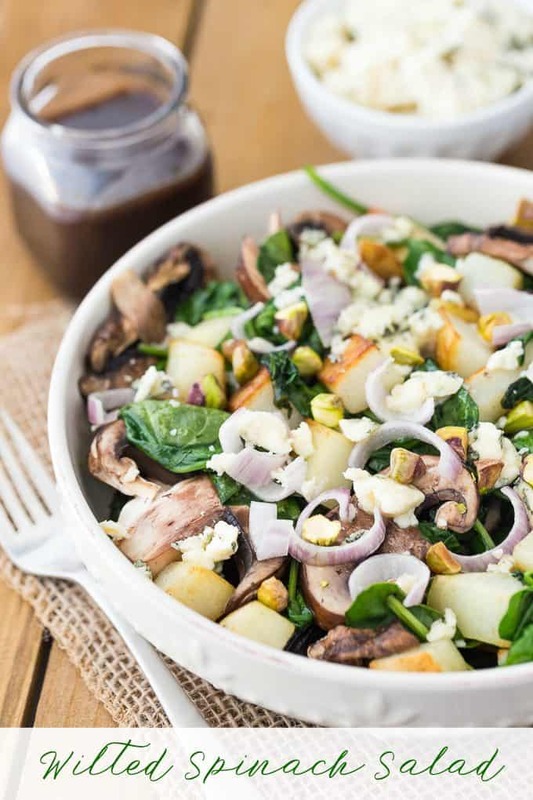 This Crimini Mushroom and Crispy Potato Wilted Spinach Salad with Raspberry Balsamic Dressing recipe sets itself apart from other spinach salads. Wilted spinach salads are a classic salad that doesn’t gain much attention these days. If you are a fan of spinach, give this wilted spinach salad a try. This is one hearty green salad. 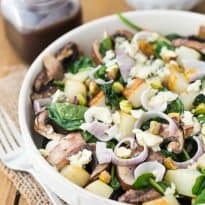 It is loaded with russet potatoes, mushrooms, crumbly cheese, red onions in a sweet and tangy raspberry balsamic dressing. Trust me; you will walk away feeling completely satisfied with this salad. No need for meat, the mushrooms, and potatoes are filling enough. Whether you serve this for lunch, dinner, or a side to your meal, this recipe is going to knock your socks off. Wilted spinach will take on the flavors it is cooked with. So your salad will be bursting with a variety of dimensions of flavor in every single bite. The span of a homemade vinaigrette dressing will vary. Generally, you can expect a vinaigrette to last around two weeks in the fridge. With ingredients like onions, herbs, or even fruit in our case, it can cut down the shelf life to around one week instead of two. Place any dressing you will not use in the salad in a container with a lid. When you go to use it later, just shake well and pour over your salad or dinner dish. You will find your dressing can separate so shaking in between uses is a must. Absolutely! Slivered almonds, walnuts, or even cashews would be a tasty topper. We love pistachios in our home, so that is what we reached for. But feel free to leave the nuts off if you don’t want the crunch, or pick whatever nut you have on hand to the top of your salad. Start by pouring some oil into a large non-stick skillet and turn heat to medium/high. Add in your potatoes and cook them until they are browned, which takes around five minutes. Add in your spinach and mushroom, and cook until spinach is wilted and tender. This is around 5-6 minutes. While your potatoes are cooking, you can work on your balsamic vinegar dressing. Grab a small saucepan and pour in your ingredients and bring to a light boil, and cook until it is slightly thickened. Once it begins to thicken, whisk in your raspberry preserves, oil, and mustard. Plate up your salad, top with onion slices, cheese crumbles, and nuts. Pour dressing over and serve. To be honest, since you are wilting the spinach, it will become pretty mushy in the fridge if you store for leftover. I recommend only cooking enough salad for what you think you will eat. You can save the potatoes and mushrooms leftover and then assembled our salad later. Just wilt more spinach in the pan, toss in cold mushrooms and potatoes to warm up, and then assemble salad that way. You can use this salad as a light lunch or a main course. So if you are serving as the main course, maybe pair with some breadsticks, garlic bread, or even half a sandwich or soup. If it is a side dish, feel free to pair with any main dish you enjoy. From a juicy burger to a chicken casserole. This salad is versatile and will work well with most main dishes. Plus it is a great dish to serve guests since it is unique and different than a classic green salad. Give my recipe a try today! I love the pairing of the hearty and starchy potatoes next to the mushrooms and wilted spinach. It is the perfect salad that always hits the spot. Best of all it is straightforward to make. If you are lucky, you might have all the ingredients handy in your pantry already. 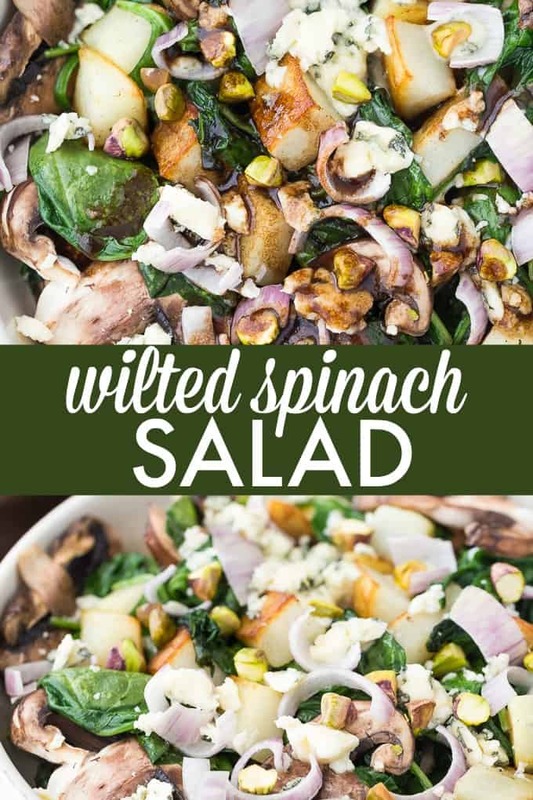 Have you ever tried a wilted spinach salad before? Crimini Mushrooms and Crispy Potato are topped on a bed of wilted spinach drenched with a raspberry balsamic dressing. Pour 1 Tbsp olive oil into a large nonstick skillet over medium/high heat. Add potatoes, stirring often and cook until browned, 5 minutes. Add spinach and mushrooms and cook until potatoes and spinach is tender, additional 5-6 minutes. While the potatoes are cooking, pour balsamic vinegar into a small saucepan over medium heat, and allow to boil lightly until consistency has thickened, roughly 1 minute. Wisk in raspberry preserves, 2 Tbsp olive oil, and mustard. Place even amount of the mushroom, spinach and potato mixture onto salad plates, top with onion slices, crumbled Gorgonzola cheese and pistachios. Drizzle balsamic dressing evenly over each serving.